The transmitter's plastic housing could burst and cause an injury. 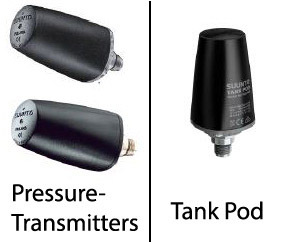 The Suunto Wireless Diving Tank Pressure Transmitters and Tank Pods are pictured as below. Stop using the devices and contact your nearest authorised Suunto service centre or dealer for a free inspection. Any affected transmitters will be upgraded and replaced free of charge where necessary. For more information, contact Brandex Adventure Sports Ltd.